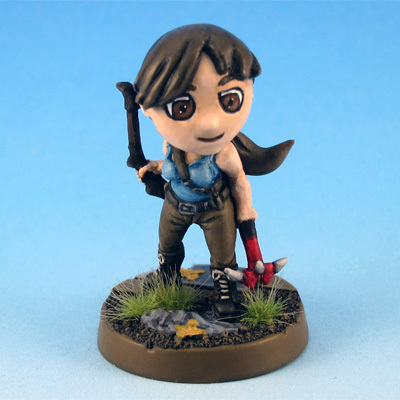 After painting mainly chibi minis for some time now, it wanted to paint something different. As couple of mecha minis from Jon Paulson’s Mecha Front Kickstarter arrived late last year I jumped at the opportunity and began painting them. I loved mecha minis since I got my hands on BattleTech minis in the late 80s. 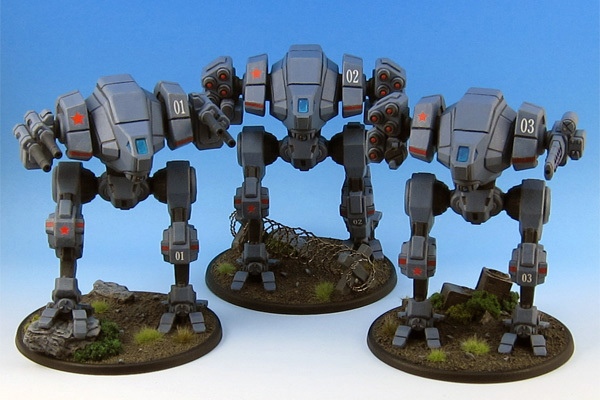 Have painted dozens of those and the Mecha Front minis remind me of them a lot. As an added bonus they have a much more appealing size with 15mm instead of the 6mm BattleTech minis. It took quite some time to finish the minis, as I was also fixing my damaged Warmachine minis at the same time. Some repositioning of the legs and adding magnets to the weapon arms so I could exchange the weapon layout also added to the time it took to finish the minis. At long last all three variants of the Neo-Bloc Goshawk are finished. Need to find some time to try out the game system, soon.